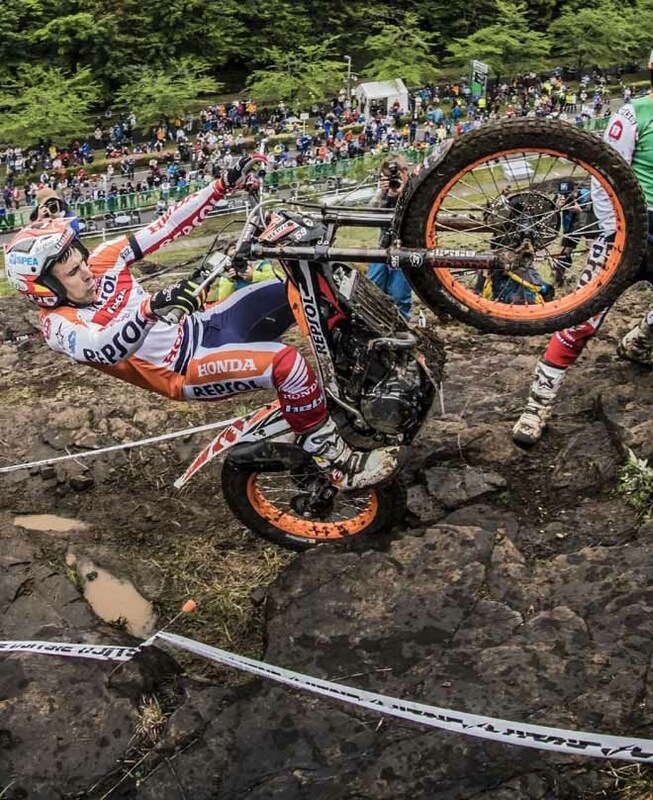 Defending champion Toni Bou - Repsol Honda maintained his unbeaten run with victory on the opening day of TrialGP Japan, which marked round two of the 2017 FIM Trial World Championship, held at the Honda owned Twin Ring Motegi circuit on Saturday. The thirty-year-old Spanish superstar, who is bidding to win his eleventh straight title, started the day with two fives in the first three sections before stringing together a series of strong rides to record a comfortable victory. 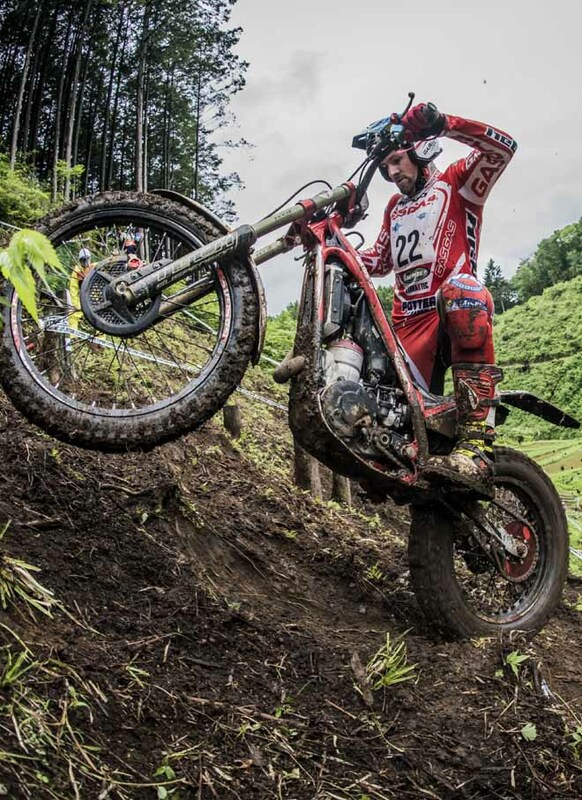 Overnight rain had greatly increased the severity of the fifteen sections and even after many of them were eased the course provided a tough test for the twenty-one TrialGP riders. With his first lap score of twenty-six giving him a six-mark advantage over Britain's James Dabill - Gas Gas, on lap two Bou simply motored clear. While the rest of the entry struggled as mud was dragged onto the rocks, he mastered the slippery conditions to slash four marks off his lap one total and win by twenty-four marks. "It's Honda's home and a very important event for me," says Bou. 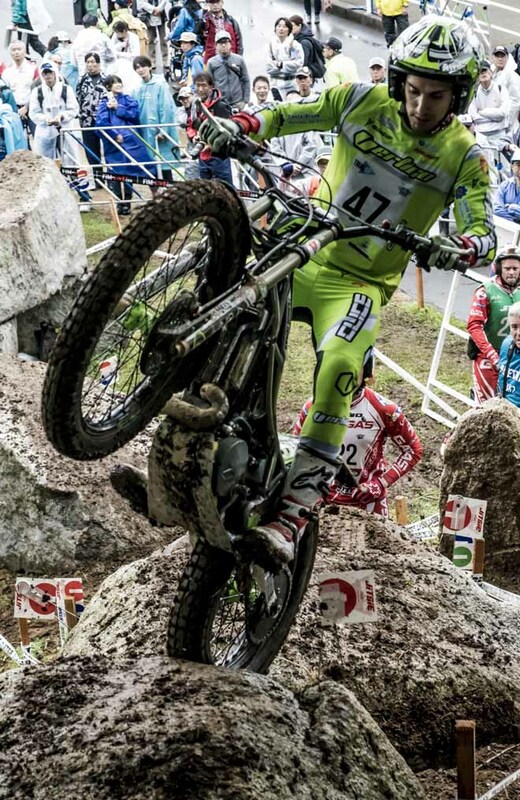 "I had a strong ride so I'm very happy with my result and happy for the fans. A fantastic day." Yesterday's top qualifier, Dabill took full advantage of starting at the back two places behind Bou. carefully studying the World Champion's lines, Dabill was a strong second after the first lap and even after a run of five maximums on lap two he maintained his position to finish two marks clear of Japan's Takahisa Fujinami - Repsol Honda. "I've matched my career-best result so I'm really, really happy," says Dabill. "Starting last was a big help and I used it to my advantage, especially on the first lap. It was close in the end, but we did enough on the first lap." Fujigas was gifted a record twenty-seventh podium finish at Twin Ring Motegi by a costly second lap error from Jeroni Fajardo - Vertigo which dropped the Spaniard to fourth, one mark behind the Japanese fan favourite. After his mistake in qualification, Spain's Adam Raga clearly struggled with his early starting number and despite staging a second lap comeback ended the day fifth - his lowest finishing position for five years - but still comfortably ahead of compatriots Jaime Busto - Repsol Honda and Jorge Casales - Beta who ended the day sixth and seventh respectively. Albert Cabestany - Sherco was another rider who started near the front and the Spaniard, third at the opening round, could only manage an eighth-placed finish today. 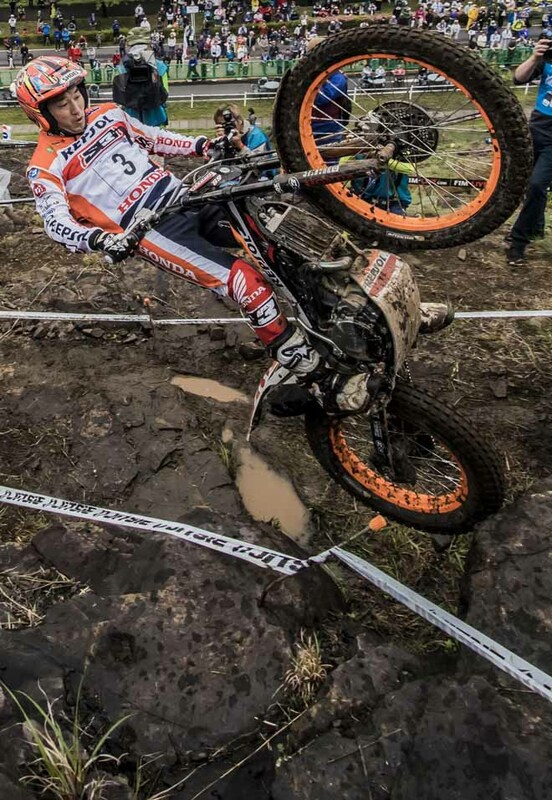 France's Gael Chatagno - Gas Gas won a closely contested Trial2 competition, eventually running out five marks clear of Spain's Francesc Moret - Honda. British hopeful Iwan Roberts - Beta was third and moves into the championship lead. 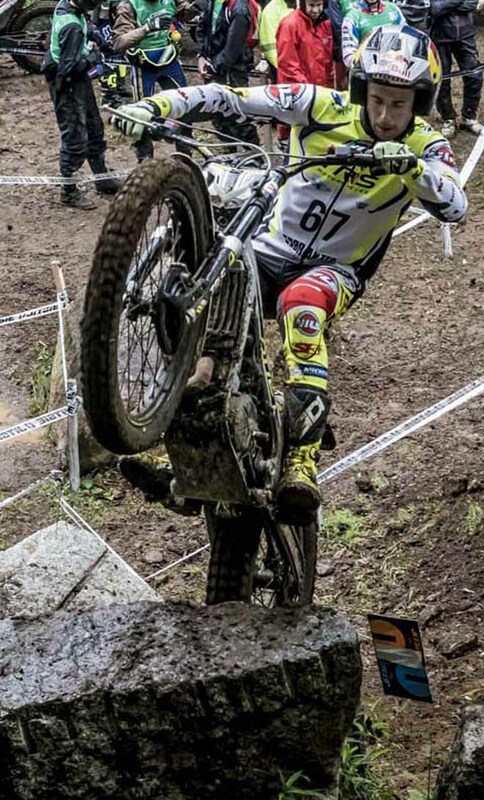 Britain's Toby Martyn - Vertigo was in line for a podium finish but picked up a maximum on the final section when his safety lanyard became detached, killing his engine. Victory in Trial125 went to rising British star Billy Green whose eventual seven-mark winning margin over round one winner Lorenzo Gandola - Scorpa from Italy could have been much bigger. Spain's Eric Miquel - TRS was third. Better weather is forecast for tomorrow's second and closing day, but even if drier conditions prevail Sunday's test is sure to be another tough one. ...più tardi la traduzione...scusate ma oggi c'era anche la gara di Trial d'Epoca che noi organizziamo..